My husband surprised me yesterday with a bouquet of flowers. An early birthday gift, as it were. "We won't be here for your birthday, so I thought I'd give you some today." Sweet man. Roses, gerbera daisies and alstroemeria with lots of green salal. So very fresh and pretty. I broke the bouquet apart. Now there's a vase on the coffee table, two on the mantel, and one in the bedroom. I do love flowers, don't you? Lovely bouquet of flowers! your hubby is a sweetie! Happy Birthday to you! Happy Birthday! I am so enjoying these bouquets-I must say I love the white and green combination. Happy Birthday, those are such lovely flowers. Oh they are lovely - such pretty pictures - such a sweet husband - I love men that give flowers - and remember events - so thoughtful. White bouquets are so elegant...they look good in any vase or decor. Your husband has a good eye! That is just TOO TOO sweet! And the flowers are very lovely. Give him an extra hug for all of us for being so thoughtful! And have a Happy Birthday....soon. Sweet hugs....to you both! An early Happy Birthday to you, Lorrie. Your hubby is very sweet to give you flowers ahead of time and they are beautiful. White is quite elegant I think. Happy day to you! Happy birthday Lorrie. Your hubby is sweet to give you flowers, I like an all white bouquet. Beautiful! And Happy Birthday, Lorrie! What a sweet hubby! A lovely mosaic, alstroemeria are my favourite cut flowers. Sweet man for sure...Happy early birthday! I love flowers. Your hubby is wonderful and has excellent taste in flowers. Take care and have a lovely week. Lucky you! Happy birthday when it comes. I love green and white, so fresh and pretty. Joyeux Anniversaire, ton mari est un amour, les fleurs sont magnifiques ! Ma grand-mère les aimait beaucoup aussi, et c'est elle qui m'a éveillée à leur beauté. Quand j'étais petite je disais que je deviendrais fleuriste avec elle. A chaque fois que je suis au jardin je pense à elle. That's so sweet of him! And, I wish you a fabulous birthday for when it gets here. I hope you have a great day planned! Lovely bouquet...thoughtful husband! Happy B-Day when it arrives! Best blessings for a wonderful year ahead. Oh and white! I love white. What a dear man, eh? Lovely flowers! Happy early birthday! Happy Birthday Lorrie! I hope that your time away on your birthday will be sunny and full of smiles! The photos you took in Finnerty Gardens are so lovely. That is one of my favourite places to wander. And white flowers have a special beauty too! And when is the birthday??? So thoughtful! And that must have been a big bundle of flowers -- your divisions are lush enough! My guy also had white flowers for me, albeit a much more modest bunch -- white ragged-edged tulips. So pretty and so fresh, just as you describe, the green and white. Happy (early) Birthday to you! Beautiful flowers--I LOVE white bouquets! How thoughtful and sweet! Your flowers are very pretty, Lorrie. Enjoy them and an early Happy Birthday! What a delightful husband you have. Congratulations on him and the forthcoming birthday. What a sweet man for sure. I do love flowers in the house. Lovely white ones, just gorgeous. I had flowers all over the house. I said because they make me happy. Enjoy! And Happy Birthday to you! You have a very thoughtful husband - I'm sure that was one of the qualities you looked for in your life partner! 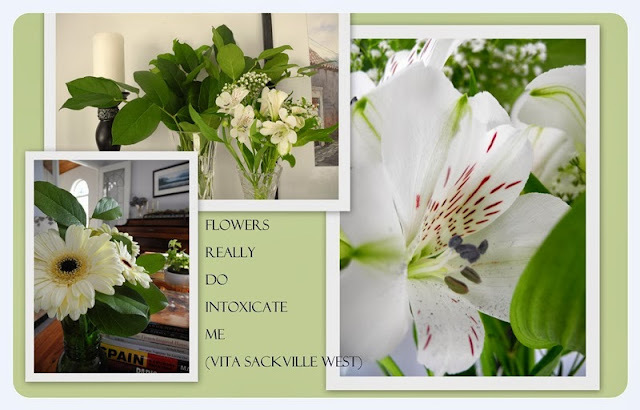 Beautiful white flowers and I agree with Vita's words. I visited the magnificent garden she created at Sissinghurst in Kent. I didn't want to leave her white garden - it was so beautiful. She was very selective about what she planted. Enjoy your birthday and many more to come! Thanks for sharing your beautiful flowers. Happy Birthday!! Thanks for stopping by. Yes they are glad about the pecan trees, but not the walnut, so was glad they found someone else that did.